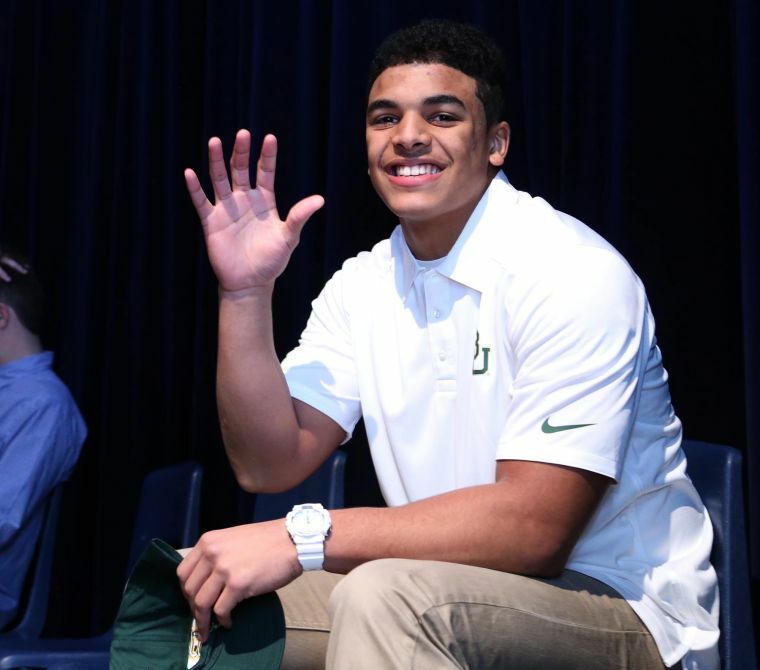 Midway defensive lineman Jamie Jacobs does the bear-claw gesture before signing with Baylor. Staff photo-Rod Aydelotte Midway Jamie Jacobs signs with Baylor. Staff photo-Rod Aydelotte Midway head coach Terry Gamble, left, helps Jamie Jacobs with his signing papers to Baylor. There was no signing day drama, no last-minute surprises, no despair and anguish by the Baylor coaching staff. 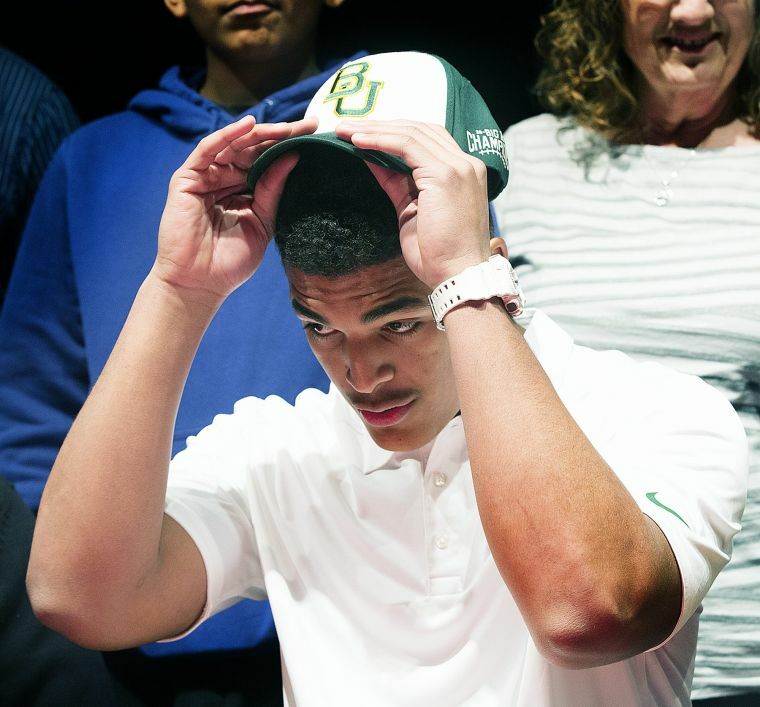 Baylor had most of its 2014 verbal commitments by last summer, and they made it official Wednesday morning. The Bears had all 23 of their new recruits signed to national letters of intent by 9:45 a.m., which might be some kind of NCAA record for speed signing. Baylor coach Art Briles said it was strange not having to make a last-minute pitch to recruits on the final weekend before signing day. This year’s recruiting class is a direct reflection of the success the Bears have enjoyed on the field as it ranks No. 22 nationally by ESPN and No. 23 by Scout.com. The Bears have made a school-record four straight bowl appearances and won the Big 12 championship for the first time last fall. Briles said this year’s recruiting class was built off the Bears’ 8-5 season in 2012, which ended with a win over UCLA in the Holiday Bowl. Next year’s class will be built off the breakthrough Big 12 championship season in which the Bears finished with a school-record 11-2 mark. This will be the first class of Baylor recruits that will play every season at new McLane Stadium, which will open Aug. 31 when the Bears host SMU. Highlighting Baylor’s new class is a gifted group of receivers led by Mount Pleasant all-American KD Cannon. He’s rated the No. 4 receiver nationally by ESPN and No. 5 by both Scout and 247Sports. Cannon caught 80 passes for 1,252 yards and 16 touchdowns as a senior after making 104 catches for 1,597 yards and 25 touchdowns as a junior. The 5-11, 160-pound Cannon has drawn comparisons to former Baylor All-America receiver Kendall Wright, who now plays for the Tennessee Titans. Joining Cannon is Texarkana Liberty-Eylau’s Davion Hall, a 6-2, 190-pound receiver with speed and leaping ability who is rated the nation’s No. 38 recruit by ESPN. Hall graduated from high school early and is enrolled at Baylor this semester. Willis receiver Chris Platt is a two-time Class 4A 400-meter champion, while Alief Elsik’s Ishmael Zamora is a Class 5A 110-meter hurdles champion. With Baylor losing seniors like Ahmad Dixon, K.J. Morton and Demetri Goodson, Briles and his staff brought in five defensive backs. Tion Wright of Moorpark College and Chris Sanders of Eastern Arizona College are already enrolled at Baylor and should make an immediate impact. Pflugerville Hendrickson’s Chance Waz, Mesquite Poteet’s Verkedric Vaughns and Princeton’s Jourdan Blake are coming in as freshmen. Blake, the son of former Oklahoma Sooners head coach John Blake, starred at quarterback for Princeton High School. Briles believes the Bears stocked up on both the offensive and defensive lines. Lackawanna (Pa.) College offensive lineman Jarell Broxton is enrolled at Baylor and has a chance to play next fall. Clear Lake’s Blake Blackmar is rated the No. 21 offensive guard nationally by Scout, and played in the Semper Fidelis All-American Bowl. They’re joined on the offensive line by Waxahachie’s Patrick Lawrence, Houston Bellaire’s Devonte Jones and Rockdale’s Josh Pelzel. Midway defensive end Jamie Jacobs arrives with a crew of defensive linemen that includes Mesquite Horn tackle Andrew Morris, Houston Lamar lineman Ira Lewis, Magnolia West end Xavier Jones and Cibolo Steele end Josh Malin. With senior tight ends Jordan Najvar and Jerod Monk gone, Baylor signed tight ends Jordan Feuerbacher from Kingwood Park and Blake Mahon from Coppell. The Bears didn’t bring in any new quarterbacks, but signed 6-3, 220-pound power back Terence Williams, who rushed for 4,306 yards and scored 54 touchdowns in three seasons at Ennis. Briles felt he couldn’t go wrong signing Terence Williams after seeing what former All-America receiver Terrance Williams, who is of no relation, did for the Bears from 2009-12 before playing for the Dallas Cowboys. Nacogdoches defensive end Greg Roberts is expected to grayshirt and enroll at Baylor next January. Two commitments didn’t sign with Baylor due to academic qualifying concerns, including Rockdale linebacker James David, who signed with Navarro College, and Wylie linebacker T’Kevian Rockwell. Baylor’s only new linebacker is Grant Campbell, a transfer from Bakersfield College who will have a shot to replace all-Big 12 outside linebacker Eddie Lackey. Campbell is enrolled at Baylor and will go through spring drills. Briles likes the talent, depth and athleticism of the 2014 class, and appreciates the way the recruits stuck with Baylor after making their verbal commitments. Profiles of the Bears' 2014 recruiting class. When I awoke Wednesday morning, the sun was cresting over the horizon, the birds were singing and everything was . . .